ABU DHABI, United Arab Emirates – Pope Francis received a grandiose, pomp-filled welcome on Monday as he opened his historic visit to the Arabian Peninsula by meeting with Emirati rulers ahead of an address to faith leaders gathered in a Muslim region known for its restrictions on religious freedom. 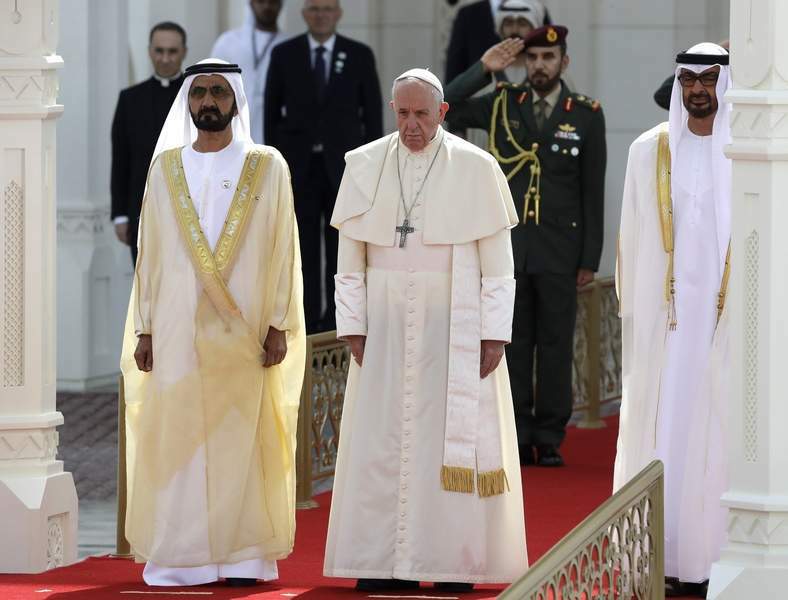 Even for a nation known for its excesses, the Emiratis' red-carpet welcome was remarkable for a pope who prides himself on simplicity. It featured horse-mounted guards escorting the pontiff's motorcade through the palace gardens while the flyover trailed the yellow and white smoke of the Holy See flag. 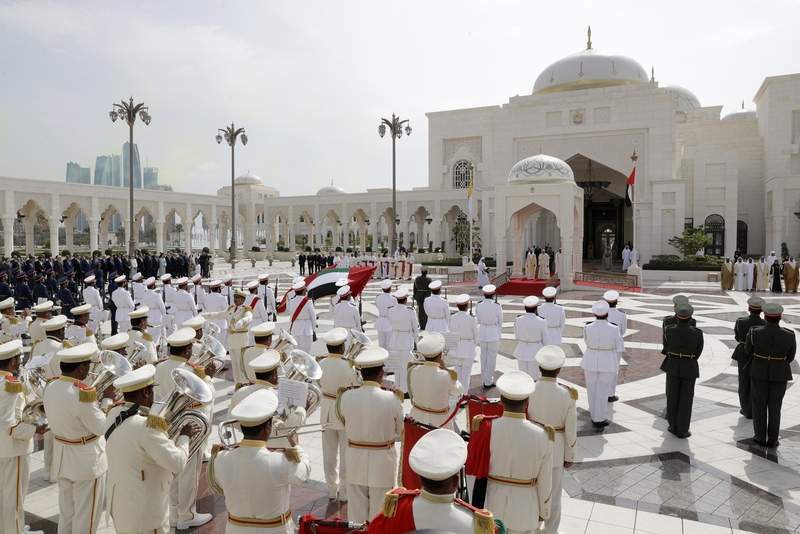 As cannons boomed and a military band played, Francis stood somberly between Abu Dhabi's powerful crown prince, Sheikh Mohammed bin Zayed Al Nahyan, and the Emirati vice president and prime minister, Sheikh Mohammed bin Rashid Al Maktoum, during the presentation of delegations in the courtyard of the domed palace. 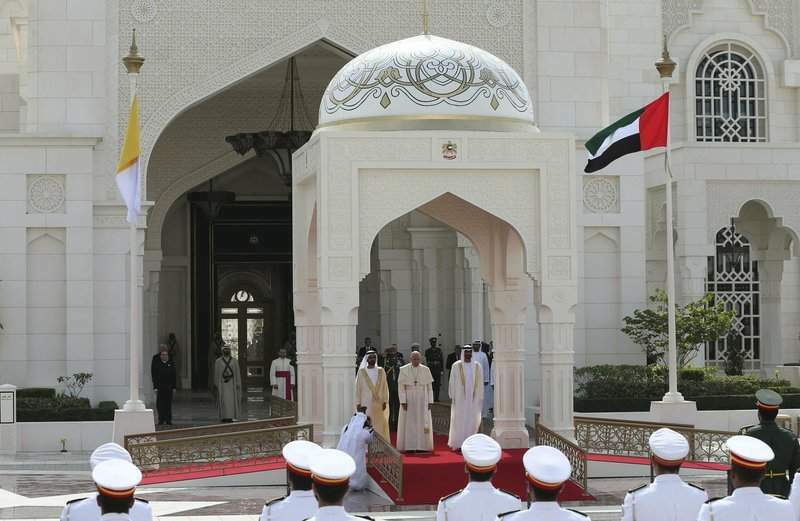 In a message to the prince, written in the palace book of honor, Francis thanked him for his hospitality and assured the people of the UAE of his prayers and "the divine blessings of peace and fraternal solidarity." Francis gave the crown prince a medal depicting his peace-loving namesake, St. Francis of Assisi, meeting the Egyptian sultan Malek el-Kamel 800 years ago. "We discussed enhancing cooperation, consolidating dialogue, tolerance, human coexistence & important initiatives to achieve peace, stability and development for peoples and societies," Sheikh Mohammed tweeted. Francis' speech to the gathering of faith leaders on Monday evening is to be the highlight of his brief, 40-hour visit to Abu Dhabi, the first to the Arabian Peninsula by a pope. His trip culminates on Tuesday with a huge papal Mass at the city's sports stadium expected to draw some 135,000 faithful in a never-before-seen display of public Christian worship here. It was a reference to the UAE's often-stated claims of religious tolerance — it has a minister for tolerance, is hosting the interfaith meeting Francis is attending and has declared 2019 its "Year of Tolerance." That respect for non-Muslim forms of worship, however, runs up against the political reality of media censorship, repression of political dissent and limits placed on religious freedom. Francis had actually made an urgent appeal for an end to the humanitarian crisis in Yemen just before he left the Vatican, calling Sunday for observation of a limited cease-fire so that food and medicine can get to its people, who are suffering the world's worst humanitarian crisis. The UAE has been Saudi Arabia's main ally in the war in Yemen, where a Saudi-led coalition is fighting the country's Houthi rebels. Francis' pre-trip appeal was a way for him to avoid embarrassing his hosts with a public denunciation of the humanitarian costs of the war while in the region. In another sign that regional politics was playing a not-insignificant role in Francis' visit, the papal plane flew north of Qatar and around the peninsular, energy-rich nation on his flight Sunday. Four Arab nations — Bahrain, Egypt, Saudi Arabia and the United Arab Emirates – have been boycotting Qatar since June 2017 as part of a regional political dispute. Tensions are still high between the nations, especially after Qatar's win at the Emirates-hosted Asian Cup soccer tournament this past week. By avoiding Qatari airspace, Francis omitted sending a telegram of greetings to the country's ruler, Sheikh Tamim bin Hamad Al Thani, as he would do when flying through the airspace of countries. He sent one when passing by the island nation of Bahrain.